Among the best preserved of the older homes that dot the quint lanes of Pass Christian is “Kiskadee,” which once housed the town’s telephone switchboard. It is especially noted with its six-over six windows and double-entrance doors. 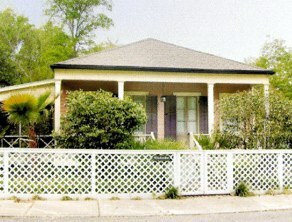 A screened porch addtion and rear guest house are recent renovations glorified by its gardens.